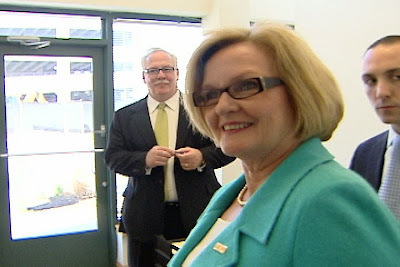 Sen. Claire McCaskill was one of nine Democratic lawmakers to sign a letter to President Obama Thursday that says other countries should take a larger role in dealing with climate change. "Poorly designed climate policies could jeopardize US national interests by imposing burdens on US consumers, companies and workers without solving the climate challenge," the Democratic Senators wrote. "Engaging developing nations will be especially important as they represent half of global emissions today and are expected to account for nearly all of the growth in future emissions," they added. The New York Times notes the Senators are mostly from industrial states or regions "heavily dependent on coal for power." The Senators said they would support climate legislation if all nations are held to such stringent limits on emissions. The letter to Obama comes just days before the United Nations climate change talks in Copenhagen. Sen. Kit Bond has joined other Republicans in blasting hacked e-mails that show climate data was manipulated. Bond called it "a pattern of egregious misbehavior by scientists."